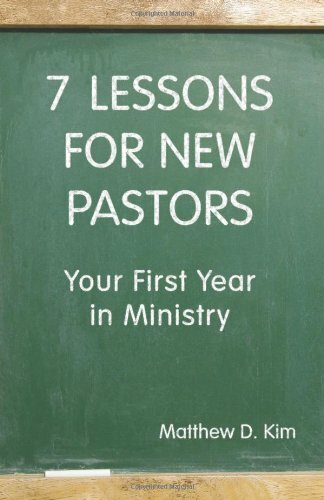 In 7 Lessons for New Pastors, author Matthew Kim discusses various experiences he had during his first year as a senior pastor. He offers seven lessons that he learned and continues to learn as a young minister in hopes of assisting others as they navigate through their first year in ministry-- and beyond. Learn how to create balance in your new life as a minister, get a behind-the-scenes look at what pastoral life is really like, and read advice on how to find the right church. Matthew D. Kim (PhD, University of Edinburgh) is Associate Professor of Preaching and Ministry, Co-Director of the Haddon W. Robinson Center for Preaching, and Director of Mentored Ministry at Gordon-Conwell Theological Seminary. He is the author of several books, including Preaching with Cultural Intelligence (Baker Academic, 2017), which was named the 2018 Preaching Book of the Year.